Thanksgiving is a time of the year that is great for décor! Part of the fun of the holiday is all the decorations. If you’re like me, you really enjoy creating a festive home atmosphere before family and friends come over for a scrumptious Thanksgiving meal. From wall décor to cute dining table centerpieces, we’ve put together a list of our 10 favorite and easy Thanksgiving crafts. Check it out! These cute little turkeys are a great craft to make with the kids. There are only 6 art supplies that you need and the little ones can create a turkey without much help from you. Add some pretty fall feathers, googly eyes and a nose to pinecones and you have an adorable pinecone turkey to add to your Thanksgiving décor. Is it your turn to host the holiday dinner this year? If you have a large family like mine, which is over 70 people, finding a place for everyone to sit can be a daunting task. These super simple burlap place cards make it easy for everyone to know where their seat is! Either use a leaf shaped cutter or print out some leaf shapes onto stock cards and cut them out with scissors. Add the name of your guest and clothespin it to the burlap. Making these place cards is a breeze, but the real fun begins when you have to decide where everyone sits. Good luck! Whether it’s in the dinner or part of the décor, turkeys are a staple of Thanksgiving. Let the kiddos contribute to the holiday with these darling finger paint turkeys! They’re a super simple DIY project that’s really messy, so we suggest the kids paint outdoors or a couple of days before your guests come over. Mix together a little paint, a wooden board and some holiday fun and you have a piece of Thanksgiving art that your family will love for years to come. Did you ever think about getting crafty with the wine bottle once you’ve finished all the yummy contents? Try making a fun centerpiece for Thanksgiving by turning your wine bottles into pieces of candy corn! Remove the labels and spray paint a base coat of white. Add some orange, then some yellow. Your favorite wine bottle sticks around a little bit longer and you have a super simple yet festive centerpiece for your table. It’s commonly believed that the Europeans were first introduced to corn, or maize, at the first Thanksgiving meal. 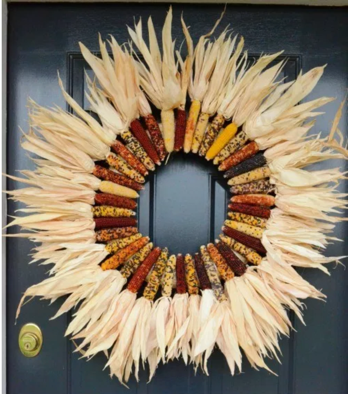 Pay homage to this history with this gorgeous corn wreath. Simply find assorted colors of Indian corn and glue them to a straw wreath. That’s all you have to do! Once all the glue has dried hang your wreath and welcome your guests in style! Giving thanks for everything that makes our lives so amazing is essence of Thanksgiving. Remind your guests of the true meaning of the holiday with a thankful tree. By adding some chalkboard paint to wooden circles, you can have each guest hang a pendant of what they’re thankful for this year. Tired of all the pumpkin and turkey decor but still looking for something rustic to add to your home? These adorable candleholders might be just what you need. Simply glue some fall twigs to a glass candleholder and let it dry. If you want a more elegant look, spray paint the twigs white or gold! After all that turkey at dinner, sprawling out on the couch afterwards is probably one of the comfiest things you can do. Keep up the Thanksgiving spirit with these DIY pillow covers! All you need is some iron on vinyl and a fall colored pillow case. Iron down the vinyl and your sleepy self will be saying thanks every minute of your post-dinner nap. Ever since I was a kid, I’ve always loved to cook and help my mom out in the kitchen. If your little ones love to be your sous chef, preserve the moment on this adorable oven mitt forever! Their precious handprint makes for the perfect holiday turkey. It’s also a great DIY craft that’s cheap to make and lasts for a lifetime. A traditional way to dress up the front porch is to place some pumpkins flanking the entry way or hang a wreath on the door. Change it up this year and let the kids make some decorations to hang up outside. These adorable Thanksgiving wind socks take almost no time to make but look so cute hanging outside! Grab an old soup can and paint it brown. Give your turkey some eyes, a nose and sturdy streamers for a tail by gluing them all to the can. Hang up your birds and let them greet all your holiday guests. What crafts are you making for Thanksgiving this year? Share with us in the comments!